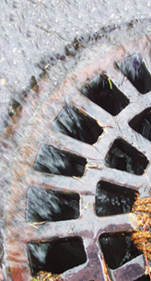 Stormwater Management Products << United Labs, Inc. The goal of Stormwater Management is to protect the quality of waterways by reducing the discharge of sediment, oil and chemicals into storm drains, surface water and groundwater. Stormwater Management Regulations are a key component of the EPA's Clean Water Act, and a Stormwater Pollution Prevention Plan (SWPPP) is essential. United Laboratories offers unique solutions for Stormwater Pollution Prevention through a combination of the equipment below, maintenance products and the professional services of a United Sales Representative. Together they will bring you in-line with today's regulatory requirements. To learn more about Stormwater Management Basics and SWPPP requirements download our brochure. Protect drain passages by capturing hydrocarbons, dirt, sand, debris and other contaminants as they enter the storm drains. Great for use in parking lots, retail lots, drive-up facilities, around industrial facilities and construction sites. Helps to comply with MPDES, 40 CFR 122.26 (1999) and Total Maximum Daily Load (TMDL) requirements. The dual chambered PIT BULL attacks your stormwater issues by providing multiple filtration options in one unit. Captures sediment in one chamber and then based on filtration media chosen, filters the water in the second chamber. Use of the PIT BULL helps to comply with NPDES, 40 CFR 122.26 (1999) and TMDL requirements. Stop pollutants before they reach stormwater outflow. Blocks floating oil and debris, preventing them from moving downstream. Low profile allows vactor trucks to clean catch basin without removing unit. The WHALE helps to comply with NPDES, 40 CFR 122.26 (1999) and TMDL requirements. 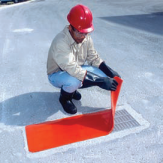 Protect drains and inlets without the need for lifting any grates. The STINGRAY lies flat over the grates, with minimal visibility as it holds tight with magnetic force. Debris is prevented from getting in the drains, while an overflow port prevents ponding in heavy rain fall. The STINGRAY helps to comply with NPDES, 40 CFR 122.26 (1999) and TMDL requirements. This tough little boom is perfectly sized for inserting into drains and manholes to absorb oil, food grease and other hydrocarbons. Tie it off and it will float on the water, not blocking the drain. Encapsulates hydrocarbons absorbed into the boom and locks them in. Be able to quickly respond when spills occur – just smack this drain seal in place over the drain and prevent contaminants from going down the drains. Available in multiple sizes and shapes and can be cut down to meet specific needs. SMACK DOWNs help to comply with SPCC and NPDES. The unique, urethane material seals off cracks and crevices as the berm snakes its way around drains to keep spills at bay. Great secondary containment option. The PYTHON can be cleaned and used repeatedly. Use indoors or out. The TIGER BOOM is designed specifically to absorb oils, greases and other hydrocarbons. Use indoors or out to control spills and leaks. High performance fibers allow these socks to absorb 15% more than most other similar products on the market, making it a great option for your spill containment needs. To learn more about these available Stormwater Managment products, contact your local United Sales/Service Representative or call our Customer Support Department at 800-323-2594.